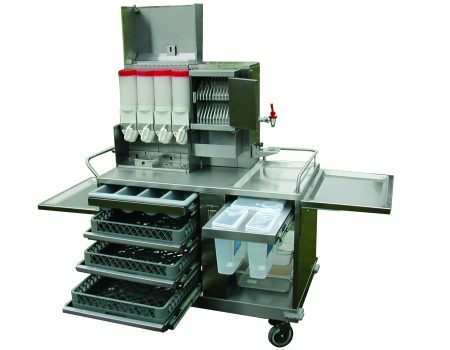 The Trent Breakfast Trolley is the ideal solution for providing a comprehensive Breakfast Service in a busy Hospital or Care Home. Manufactured entirely in stainless steel, the Trolley has an on-board boiler with the capacity to serve 40 cups (9 litre) of hot beverages. Your own supply of loose ingredients can be dispensed from four 1.2 litre dispensers into standard hospital crockery. The crockery is carried on-board in three standard 500mm square cup baskets.